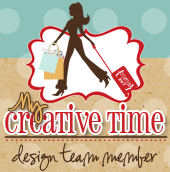 Welcome to day three of the My Creative Time 12 days of Christmas! Last year, I was able to complete all twelve days but unfortunately, my son got sick and well, we all know how that goes! Emma and some of the Design Team have a project for the next 12 days so make sure you go check it out! I love this time of the year but I have a love and hate relationship with the weather! Love to stay in on cold rainy days but my bones do not like it! I think Im getting old! lol! 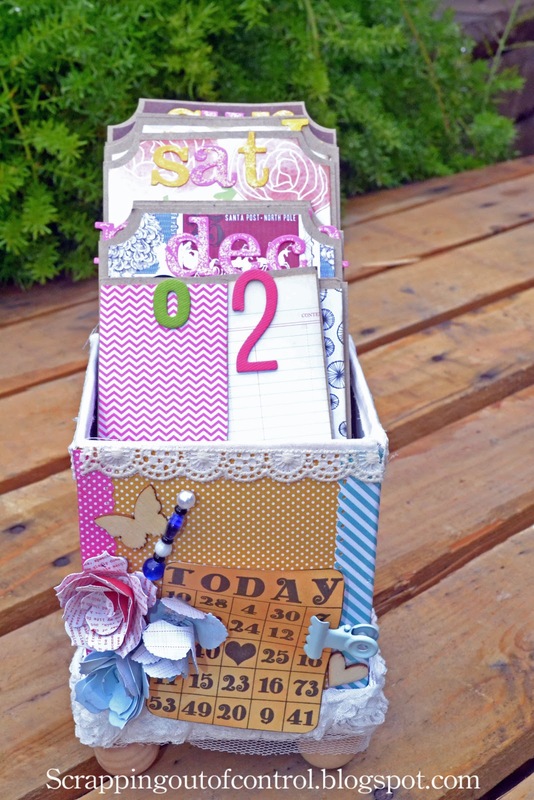 Anyways, for my project today, I made this desk calendar as a gift for a special person. I really hope she likes it! It took longer then I thought it would but I am very happy with it. For the base I used a box from the dollar store. I covered it with paper and embellished it with MCT stamps and dies. There are three different sizes of of tags so you can see the month, week, and day, For the numbers the tags are cut in half so she can changed the numbers. The day and months are from the MCT lower case die! Love how it came out! This is not my original idea but I cannot find the link to the Youtube channel I found it at. If you find it please let me know! I don't think it's exactly like the one I saw. I did not have any directions so I just had to "wing" it.. 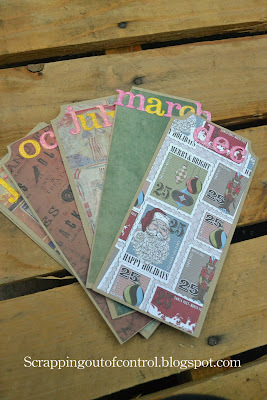 Here is a picture of the months. I used different paper to reflect that month. The MCT Anyday bingo and Crossword went perfect with this calendar! Here is a close up of the numbers. Okay, since it's Christmas, Emma have decided to give away TWELVE of her FAVORITE things to ONE LUCKY person! She will announce one of the prizes for each day in her video! So by the 12th day, you will see ALL 12 items that ONE lucky person will be receiving! All you have to do is leave your comments each day! It's that simple! Thanks for stopping by today. Make sure you visit the rest of the design team for more ideas and inspiration! Big crafty hugs! This is such a kreative idea!!! Who ever you made this for will love it!! 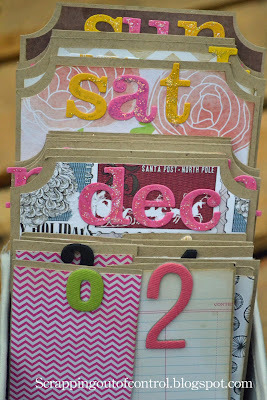 Such a cute twist on a calendar! Great job, Hope your like one feels better soon!! HI I think anyone whould like to recieve your gift . Great job. WOW what a great project....lucky...lucky person who gets this you know we all watch you tube and get ideas heck I bet you even get ideas from your own DT gal pals...this includes EMMA gosh if we were all inventors how boring right??!! We get ideas and run with it....my goodness yours turned out awesome and love how you decorated everything....you are so talented. What an amazing gift! And I love the beautiful colors...cheery for those long winter days (for me) ahead. Thanks for sharing your idea. This is so beautiful, Nancy! 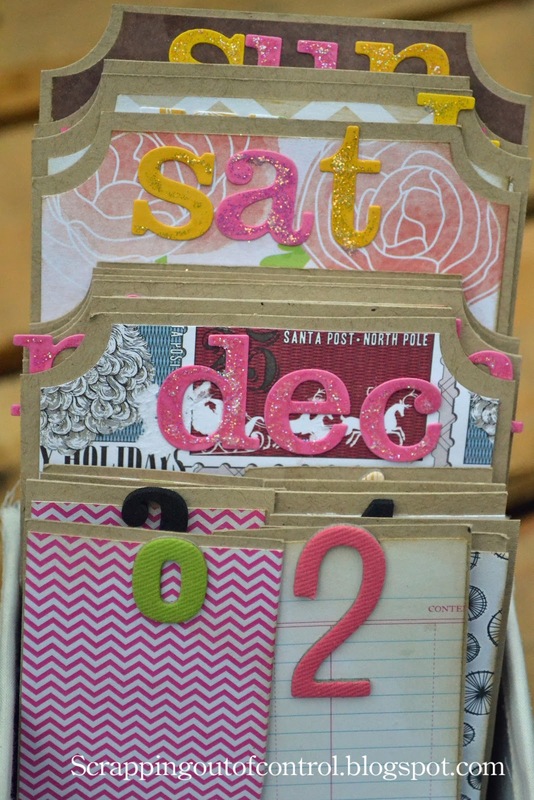 I love the papers and embellishments you use! This is awesome!! What a FUN FUN project!!! Very CUTE!!! What a fabulous project!!! And...I just have to add - I LOVE your mustache blog background! SOOOO cute!!! Very nice gift for a special friend! TFS! This is a wow project. Sure your friend will love it. Very pretty colors and great gift idea! That is a gorgeous project! What a great gift this is. What a wonderful gift - this will make someone super happy. wow i love this idea great job on it!!! Nancy! Your desk calendar is amazing!!! Now I want to make one too! Wow..very cute! You put a lot of work into that, I'm sure your friend will love it! 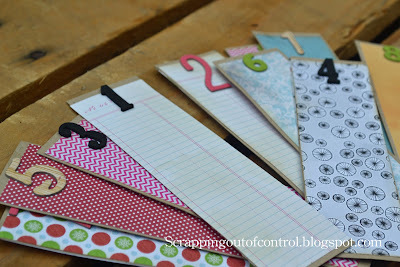 What I love your organizer, I need to make one of those for me!, thanks for sharing. This is so cute! You have given me another great project to try to make:) Thanks for sharing! I have never seen this calendar idea before...I really like how different it is. Great job! So pretty. Wow!! You did a great job! I know your friend will love this! Nancy ~ OH MY GOSH!!!! 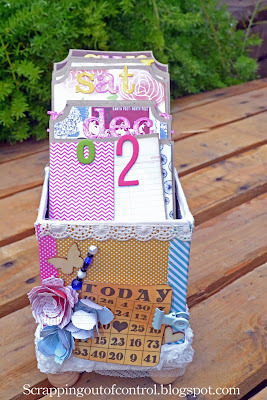 I LOVE, LOVE this calendar box! I am in AWE of how you came up with this idea and the execution!! The colors, the papers, the detail are simply STUNNING and GORGEOUS! If by chance the person doe NOT like this ~ send it my way! It may help me get organized!!! That is if I would even put something in here ~ too GORGEOUS the way it is!! LOVE ~ AWESOME job like always! Such a creative, thoughtful, heart-warming gift! Your friend will be ecstatic when you present her with this. Touching, and beautiful. Thank you for sharing. OMG! I love your BEAUTIFUL Calendar Gift...your friend will love it! The details and colors are so GORGEOUS! Thank you for sharing :) Have a wonderful day! This is so cute and full of fun colors. 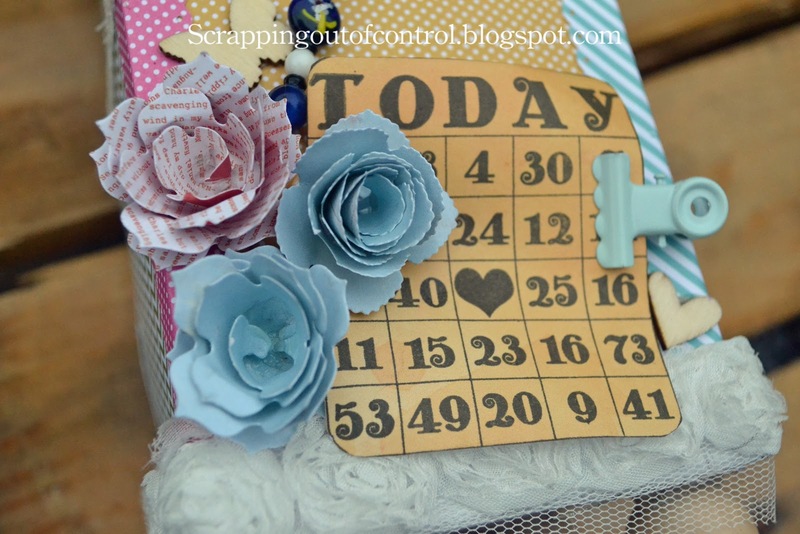 Beautiful calendar, what a labor of love. I love the papers you used and the color combo. Very, very lovely! Wow what a great idea for a calendar. BEAUTIFUL! The calendar is gorgeous. I will have to try this. Very pretty. Love all the details. nancy this is an AMAZING gift! I know she is going to love it!!! Wow! I can tell you really worked hard on it! I'm sure your friend will appreciate such a beautiful gift! Wow this is so awesome and clever! I love this idea and the way you pulled it off!! What and awesome idea for a calendar. So much detail. Great idea. This is a great organizer idea! This is a wonderful gift idea. I am so going to craftlift this one. TFS. Adorable - love the idea- how fun is this what a great gift this would be. This is a FABULOUS GIFT!! You used really beautiful paper patterns, and the box is embellished so so cute. Your friend is really gonna dig this gift. Awesome Job!! !